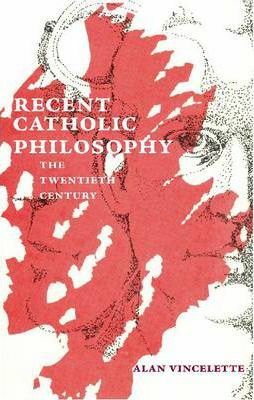 Alan Vincelette traces the thought of twenty one key Catholic philosophers of the Twentieth Century and their contributions to the philosophical movements in which their thought can most accurately be situated. These movements include Phenomenology, Neo-Thomism, Transcendental Thomism, Personalism, Existentialism, Analytical Philosophy, and Postmodernism; these figures include Stein, Von Hildebrand, Dussel, Gilson, Maritain, Wojtyla [Pope John Paul II], Rousselot, Rahner, Lonergan, Ebner, Mounier, Nedoncelle, Lavelle, Marcel, Zuburi, Anscombe, Taylor, Jacques, Marion, Lacoste, and Desmond. These and other Catholics have been at the forefront of philosophy in the Twentieth-Century, garnering acclaim in Catholic circles (Von Hildebrand, Gilson, Maritain, Rousselot, Lonergan, Mounier, Marcel, Marion), appreciation by their non-Catholic peers (Dussel, Rahner, Ebner, Anscombe, Taylor, Jacques), canonization (Stein) and the pontificate (Wojtyla), a position in the French Ministry of Education (Lavelle), the honor of giving the Gifford Lectures (Gilson, Marcel, Taylor), membership into the British, Canadian, or French Academies (Gilson, Lonergan, Anscombe, Taylor, Marion), professorships at the College de France (Gilson, Lavelle), the Sorbonne (Gilson, Lavelle, Jacques, Marion), and the Universities of Cambridge and Oxford (Anscombe, Taylor, Lacoste), and the bestowal of several major academic awards including the Aquinas Medal (Gilson, Maritain, Wojty a, Lonergan, Anscombe), the Erasmus Prize (Marcel), the Kyoto Prize (Taylor), and the 1.5 million dollar Templeton Prize (Taylor). Containing a valuable bibliography and rich notes, this collection is an excellent resource for the student of philosophy, theology, church history, history, and western culture in general.